Yesterday I posed a question about the discovery of yeast. The question sprang to mind thanks to the coincidence of reviewing my discussion with Schlenkerla's Matthias Trum and reading and article by Rob Symes called "Yeast" in the current Taps Magazine. Symes was discussing Reinheitsgebot and explaining how it was "truly remarkable for one of the ingredients it omits." The omission wasn't purposeful. It wasn't until the 1800s that Louis Pasteur (yes, the father of pasteurization) discovered the role yeast performed in fermentation. As early as the mid-14th century, a Flemish recipe book mentions adding yeast to beer, and it seems likely that already by 1300 brewers were using some of the foam skimmed off the top of the fermenting beer from the last brew to start fermentation with the next one. 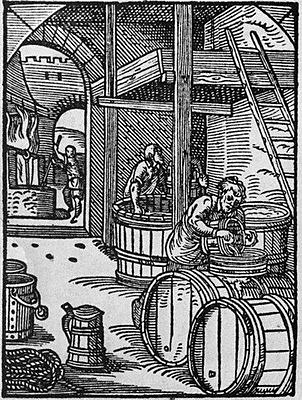 By the 16th century, brewers commonly added yeast to wort from cultures which they kept separate and which they controlled and maintained. In 1420 a brewer in Munich got permission to use yeast that fell to the bottom and regulations from Nuremberg suggest that bottom yeasts which had been identified and to some degree isolated were already in use in the fourteenth century. Pasteur's role was observing the organism and explaining why it produced sour beer. (He was a big fan of bottom-fermentation and lagering.) It was a watershed. But humans, which even a thousand years ago were pretty clever beings, had a pretty good idea of what was causing the beer to ferment. My guess is that monks were the first to really develop a theory of yeast--they were the first great brewing innovators--but whoever it was came many hundreds of years before Pasteur. Ron Pattinson has a good line which relates: "Practical problem solving wasn't invented in the 1980s." I was looking into some of the yeast research earlier in 2012 and found that Pasteur's work was based on the work of Eilhard Mitscherlich and a few others. It was because of Pasteur's work to fight spoilage that gave him a bit more noteriety. Nikola Tesla invented yeast. I read about it on the internet. I've always heard that Bavarians (if not explicitly Franconians, around Nuremberg) were making "lager" centuries ago by virtue of the cold caves they stored their beer in. The point about the Nurembergers getting permission to use yeast that had settled to the bottom though...does this really indicate *lager* yeast? When I harvest US05 or Nottingham ale yeast that's settled to the bottom of my fermenter, I'm not making lager. Matthias is a nice guy. I'd have to read up on it again but I think it was Pasteur that proved that it was the growth of living yeast that fermented beer, not some purely chemical reaction. In White and Zainasheff's "Yeast," they make a more qualified claim about Pasteur's role as "discoverer." Their assertion is that he proved that the obvious byproducts of alcohol and carbon dioxide were definitely biologically derived, and that yeast was definitely a a living organism which metabolized sugars and primarily produced these byproducts. So in that way, the modern biochemical account of yeast metabolism as a series of enzymatic pathways determined by DNA has it's roots in this discovery. So perhaps it is something like Galileo observing the manner in which the sun reflected off the moon and how we observed it on Earth to show that the moon revolved relative to the Earth and likewise the Earth to the sun. It's not true in any sense that Galileo and Copernicus discovered the position of the sun relative to the Earth -- sophisticated versions of that theory existed two millennia prior (and probably further back). But it might be appropriate to say that Pasteur and Galileo were, in their respective cases, the people who outlined the basic observation which underpins our contemporary understanding. However, selective pressure in conical fermenters has caused some modern ale yeast strains (nottingham included) to more or less *bottom* ferment. The sierra nevada strain (which is, AFAIK, descended from nottingham) does this as well. They are still ale yeasts, just bottom fermenting ones. It doesn't matter, because hardly anyone top crops anymore. One funny note: the Ringwood strain is produced by both wyeast and white labs, but one of the two (I forget which, I think white labs because I seem to remember White mentioning it) is not a true "top cropper." It's worth noting also that every yeast settles to the bottom when the action of the fermentation is over; it's largely just a question of what's going on in the foamy cap on top. If you're using Fuller's, there's a ton of yeast up there. If you're using Chico, there's probably not much. If you're using a lager strain, it's all protein and hop gunk. A 'Hefner' or Heffner was a potter, as in 'one who makes pots'. Not 'guy who ladles off the yeast'. I'll leave the linguistics to those who study it. Hefe is obviously yeast, and Trum is a scholar of brewing history, so I assume when he cites Hef(e)ner, he's referring to actual brewing jobs in medieval Germany. I was recording him and didn't ask for the spelling, so I may not be reproducing it correctly. And finally, my Google Translate doesn't get anywhere near "hef" as a root word related to pottery. I get "töpf."